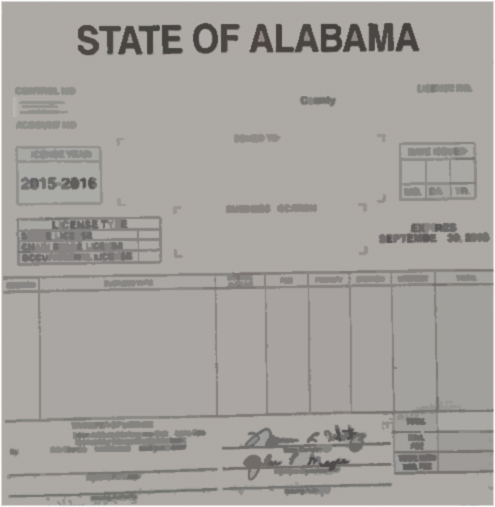 Alabama law requires annual renewal registration of vehicles each year. A registrant's vehicle tax year is determined on a staggered basis and is based on the registrant's first letter of his last name. Each of the first three items above display a registrant's renewal month and serve as renewal reminders for vehicle owners. A mail reminder is sent to the owner's last known county address at the beginning of the scheduled renewal month. It is the owner's responsibility to renew his vehicle registration during the designated month, even if the courtesy reminder does not arrive by mail. An Alabama resident who moves to our county from another Alabama county, will be required to register his vehicle in Houston County during his annual renewal month. The current tag and tax registration receipt copy, or the courtesy mail renewal notice received from the previous county, should be brought to our office for registration in this county. Each registered owner or co-owner should also bring their valid Alabama driver license or photocopy to comply with Act 2011-688 related to Mandatory Liability Insurance compliance. Proof of insurance will be required by evidence that includes the provider's NAIC, policy number, and current effective date. The best time to renew your tag in person is between the 11th and 25th of the month. Mondays and Thursdays are high activity days in the office, along with the first working day following holidays.